Rebels from the Al-Nusra Front capture four crew members of a regime helicopter which crashed in the Idlib province. 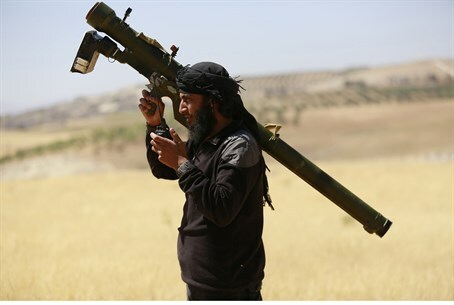 Islamist rebels captured four crew members of a regime helicopter which crashed in the Idlib province of northwest Syria on Sunday, while a fifth serviceman was killed, a monitor said, reported AFP. "A regime helicopter was forced to land in the region of Jabal al-Zawiya in the northwest, which is a bastion of (Al-Qaeda's Syrian affiliate) Al-Nusra Front," Rami Abdel Rahman, head of the Syrian Observatory for Human Rights, told the news agency. "Four of the crew were captured and a fifth man was killed by armed men in a neighboring village," he added. Official Al-Nusra Front accounts on Twitter published photos and videos with the caption "Helicopter pilot in the hands of jihadists," according to AFP. Two other servicemen from the helicopter crash were captured by another Islamist group, and at least one more crew member was believed to be on the run, Abdel Rahman told AFP. Al-Nusra Front has been an official branch of Al-Qaeda since April 2013, and dominates a swathe of northwest Syria despite months of international airstrikes. As well as fighting President Bashar Al-Assad's regime, the group has clashed with Western-backed rebels and its jihadist rival the Islamic State (ISIS) group. Last November, Al-Nusra and ISIS agreed to work together. Al-Nusra Front recently reaffirmed its allegiance to Al-Qaeda and denied any plan to break away and become a more internationally acceptable rebel force, amid speculations on Internet social networks of a split between the jihadist allies.